A state lawmaker says we could learn a lot, from Dubuque. 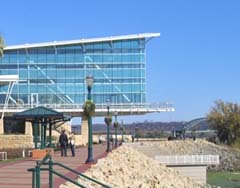 State Senator Dan Kapanke says the Iowa city has rebounded from the eighties, when unemployment hovered above twenty percent, to the point where Dubuque was able to attract expansion by IBM – and 1300 new jobs. “They started laying that groundwork back in the eighties, when their unemployment rate was so high,” Kapanke says. “They knew they had to retool . . . and they&apos;ve done that very well. Now there&apos;s an uptick in interest by companies in Dubuque, because of IBM.” Kapanke, who met recently with the mayor and city administrator in Dubuque to learn more about how the city attracted IBM, says commitment to public-private partnerships played a big part in reversing the city&apos;s fortunes. Kapanke says Western Wisconsin plenty to offer businesses like IBM, and he believes one way to promote it is as part of a larger region – even one that includes parts of Iowa.